This coffee will be fresh roasted for you. We expect Olympia Coffee Roasting Co will roast and ship this coffee in 1-2 business days depending on their roasting schedule. This is the Big Truck Organic Espresso brought to you by Olympia Coffee Roasting Co. Olympia strives to buy smaller lots at the peak of freshness to keep the blend as fresh as possible. 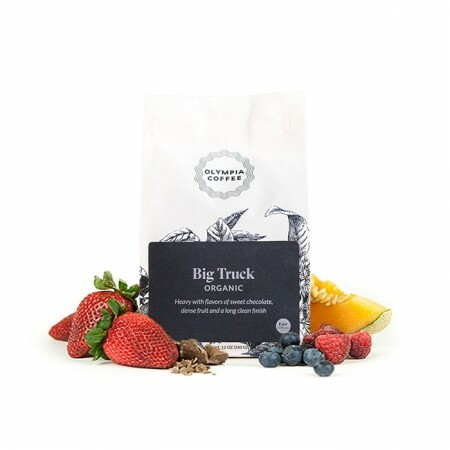 The ingredients of the blend change seasonally, yet the flavor profile for Big Truck remains the same; decadent with notes of sweet chocolate, ripe berry notes and a dense body. fabulous. perfect balance of flavors for espresso. I'd get it again it is so good. Very good. Lots of flavor. Outstanding! Love this espresso as well as any I have tried and I have tasted many. Very aromatic, mild taste. Kind of a chocolate-berry taste. Nice! None of the harshness or bitterness of some of the other samples recently. This is my first order and I have really enjoyed it. An excellent espresso, very smooth finish and taste. Good balanced cup. I used mostly pour over, but also in a press. The best results came when using a hario woodneck. No exiting notes, but a very good cup of coffee. I don't see that "ripe berry"
Pretty nice shots with amazing crema. With a little more boldness, would have been 5 star. Berry notes are too strong for my tastes. After taste was a little sour as well. Need to stick with more Earthy flavors. The ripe berry is really pronounced on this espresso. It's the first and last thing you taste. The dark chocolate is a bit too bitter and lacks the sweetness that would have given this a 5. It might be my burr dulling, but I had a tough time pulling it right. I added a gram or 2 more than usual at 20g, slightly more coarse. Great espresso and will not hesitate to buy it again. The profile was slightly bland. No big base or sweetness to cut through milk. I followed the roaster's brewing parameters and was able to dial it in to get between 19 - 20% extraction rates but it just didnt shine. The acidic notes tasted 'roasty' and with it being a lighter roast it was not something I would expect.